Process costing handles the same types of manufacturing costs as job order costing. Both systems deal with tracking how manufacturing costs such as direct materials, direct labor, and overhead flow through work-in-process to finished goods and finally, when the goods are sold, to cost of goods sold. Some manufacturers make unique products, such as aircraft, made-to-order suits, or custom teddy bears. Others mass-produce large numbers of similar or identical items, such as soft drinks, sheets of paper, and boxes of cereal. To mass-produce products at a minimal cost, assembly lines move materials and partially finished goods from one station or department to the next until they get completed into finished goods. Job order costing accumulates costs by job, using job order cost sheets that stay with the inventory as it flows through the production process. Process costing, on the other hand, accumulates costs by department. Process costing gives each department its own separate work-in-process (WIP) account for accumulating costs and tallies costs at the end of each fiscal period; job order costing uses only a single WIP account for all unfinished jobs and tallies the cost of a job when it’s finished. 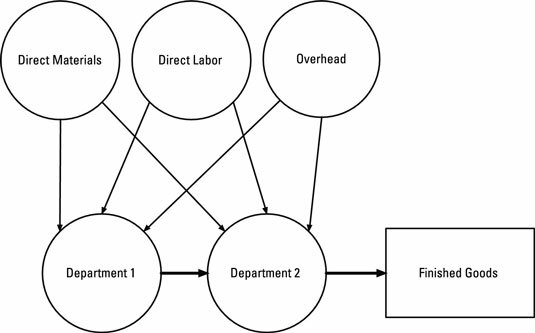 Although job order costing measures the cost of each individual job, process costing measures the cost of work actually done on WIP during a period.